Today I'm featuring a post by guest blogger, Carol. Carol is a fellow genealogist and New Englander that I've met several times at genealogy talks and conferences in Massachusetts. Carol has had her own experience exploring Ancestry's new Holbrook Collection which she shares with you below. In the Marian’s Roots & Rambles blog post on March 22, Marian's last question to the community was if the Holbrook Collection was worth the hype. In the past week, I’ve heard ‘Holbrook’ quite a few times. It started with my non-genealogy friend sending me a newspaper clipping about the collection. The following weekend, I heard it mentioned a few times at the New England Family History Conference in Franklin, Mass. And then I read Marian’s blog post. Her informative posting had me curious – would the collection have any bearing on my personal research? Indeed it did! I found a crucial difference between the original Town of Framingham 1896 birth record in the Holbrook Collection for my grandfather, Arthur Wood, and the record that the state of Massachusetts has. Image source: Ancestry.com, Holbrook Collection. Image enhanced with Adobe Photoshop. Image source: AmericanAncestors.org. Image enhanced with Adobe Photoshop. While the state record is clearer and easier to read, the crucial difference is that my gr-grandmother’s Goodwin maiden name was dropped from the State’s transcription! So, yes, for me, the Holbrook Collection is worth the hype. Would I only use the Holbrook Collection? No. But it’s a significant piece of the puzzle. Other vital records indicate a maiden name of Godwin. It’s a small difference between Goodwin and Godwin, but which one is it? That is, Arthur Wood’s parents’ names were Thomas G. Wood and Elizabeth (Goodwin) Wood. This doesn't impact the quality of the original Holbrook Collection images but it's good to remember that there will be inevitable errors in Ancestry's indexing of the collection. 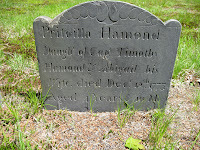 Carol has been immersed in genealogy since 2008, after the purchase of a digital SLR camera, which led to photographing headstones. Since then, she has been focusing in on her Yankee roots to bring their stories to light. In a previous post I wrote about "Getting the Whole Family Involved" and described how my non-researcher brother converted cassette tapes to digital for the family. I'm still working on getting my brother to write a post about how he did that. At the time of the conversion it's important to think about how you are going to share the electronic files. It's also important to convert the files to a format that is easily accessible for many people. My brother converted the family audio files to an mp3 file format. For most people, there will be a program on their computer such as Windows Media Player or iTunes that will play these files. It should be so intuitive that folks who really don't know much about computers will only have to double click on the file and have it start playing. I thought I would share one of the audio files here on my blog to give you a flavor of what we've done in my family (see bottom of page for link). I say we but in this case it was really just my mother. Here you'll get to listen to my genealogist mother in action. Before every recording she would state the date and who was present for the recording. Perhaps the only flaw is that in this case she used only first names when identifying people. In this audio clip recorded in 1989 the people identified are Uncle Turk, Aunt Louise and Helen Rose (my Mom). Uncle Turk is my great uncle, Frank Peterka from Pittsburgh, Pennsylvania. A few generations removed from the recording, family members could have difficulty identifying the people especially with the use of the nickname. None of the people in the recording are living anymore. My brother has titled this clip "That's How I Became a Citizen." This has nothing to do with immigration or naturalization. It's a very funny story that my uncle tells about he became a citizen of a different sort. You'll have to listen to the clip to learn what it's about. 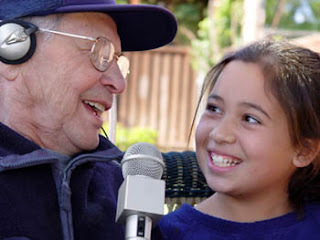 You may want to consider sharing your family oral history beyond your extended family. The stories could be relevant to local history. You could contact the relevant local historical society and see if they would be interested in the files. Before you contact them create a one page description of who is in the audio files, when it was created and the topics that are being discussed. You will want to highlight for them the items being mentioned that are relevant to the local area and its history. Another option is to share your files on the internet, in a blog or on a website, as I am doing in this post. If you decide to go that route be sure to gain permission from anyone in the audio (or video) if they are still living. If all the people in the recording have passed, then as a courtesy, you may want to ask their closest descendants for permission before posting online. In this case, I sent an email to the whole extended family to make sure everyone was comfortable with me sharing the file publicly. When posting online think about the people who may be interested in hearing the recording. It could include family members, childhood friends of the people recorded, people from the neighborhood, town or city that is the backdrop of the story and anyone associated with specific places or events mentioned in the story. Be sure to keyword your post or website so those people will be able to find the file in a Google search. In this particular audio file the backdrop of the story is Pittsburgh, Pennsylvania in the 1930s. Places mentioned are "Bohemian Hill" where the Czech community lived and the Optimus Club. The main character in the story is Frank Peterka and the supporting characters are the patrons of the Optimus Club. Search the internet (or your own files) and see if you can come up with supporting materials about the places or events being mentioned. I was able to find two newspaper articles online about the Optimus Club. Here's the audio file of my Uncle Turk. Be warned it is a large 7MG file. It will be no problem for those with high speed internet access. The duration of the clip is 5 minutes. Ancestry's New Vital Records Database: Is it worth all the hype? Recently Ancestry.com released a new database of Massachusetts Vital Records officially called "Massachusetts, Town Vitals, 1620-1988." The new digital images are taken from the microfilm of the Holbrook Collection which was filmed by Jay and DeLene Holbrook. The microfilm was created about 30 years ago and has been available to researchers for quite awhile. Ancestry.com managed to get two articles in local Boston newspapers announcing the digital arrival of these microfilmed records. The Boston Herald announced the event with "Mass. records dating back centuries go online" while The Boston Globe headlined with "A new window on Bay State's vital records." The Boston Globe article indicates that as of this week 9 million records, which is more than half of the collection, have been digitized. Does the new database warrant all the hype? I decided to take a look to see. First I searched for the birth record of Susan Cobb born in 1872 in Medway, Massachusetts to Joel and Susan (Whiting) Cobb. Ancestry.com had an image of the birth record taken from the register. The quality of the image is not very good. 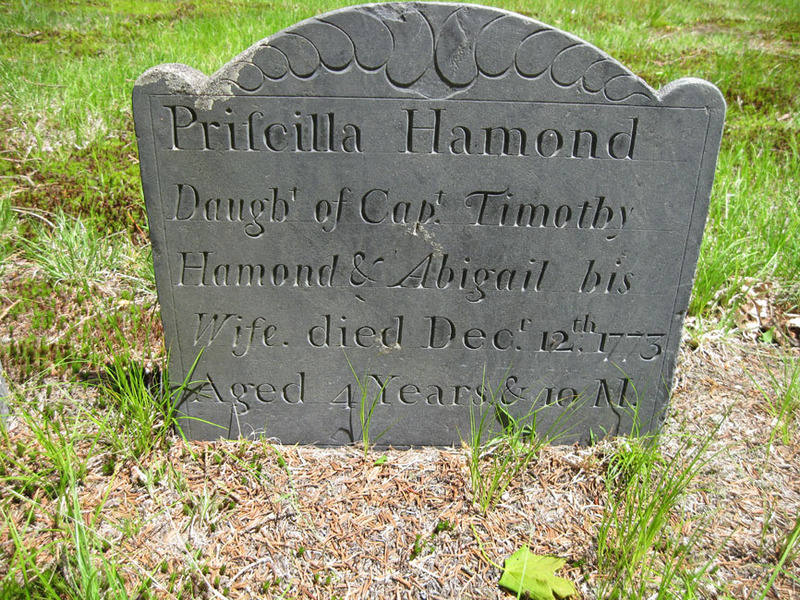 The American Ancestors website from the New England Historic Genealogical Society also has images of Massachusetts vital records. Their image of the birth record was much clearer. But as you will notice these images are not taken from the same book. The typeface from the page forms are very different. I just ran down to the Medway Town Hall in order to verify with certainty which version was which. The Holbrook Collection shows images from the original Medway Town Record Books while the American Ancestors version is likely from the copies at the Massachusetts Vital Records office. While both record books should contain the same information the original books in town hall are known to contain more detailed records such as burial location that the state record books leave off. Also, since the state vital record books are copies there is always the chance that an error could have been introduced during the copying process. FamilySearch.org also included the birth record in their database. Unfortunately they do not have a copy of the image but finding the record is helpful. An interesting aspect of this collection is the front matter for each town's records. 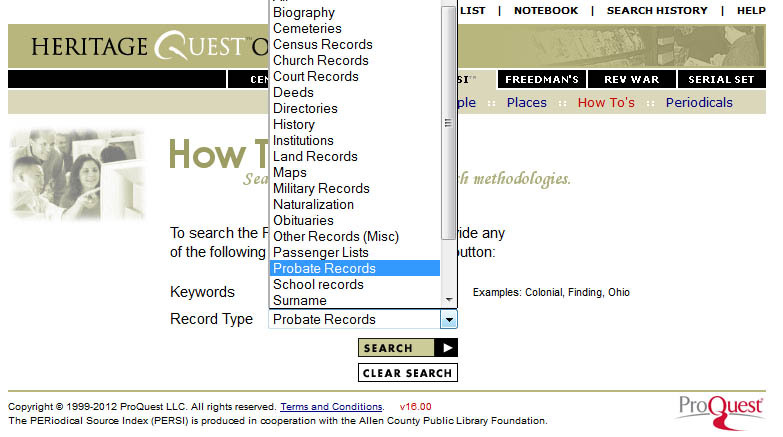 After finding your ancestor's record take the time to check out that first page of each town's digital collection. You can do that by entering 1 (or sometimes 2) in the page number box on Ancestry.com. There you will find all the information about the individual town collection. From looking at the front matter for the Medway Town Records it appears that town record books containing town meetings and reports were also in the Holbrook microfilm collection. I'm not sure at this point if that material was digitized and included on Ancestry.com or not. And if so, whether it was indexed (not likely!). 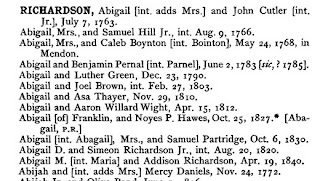 I decided to jump back 100 years and test the collection on the 1772 Medway, Massachusetts marriage record of Abijah Richardson and Mercy Daniels. The new Holbrook collection on Ancestry.com had a digital image from the microfilm. Again the quality is not great but this does look like it comes from the record book at Medway Town Hall. In contrast, the vital records pre-1841 on American Ancestors are taken from the "official series" or tan books of Massachusetts Vital Records to 1850. That means you will see a typed transcription of the marriage record rather than an image taken from the original record book. In this case using the Ancestry.com image is better than the American Ancestors transcription. FamilySearch.org has no record of this marriage at all. Nor does Fold3.com whose vital record collection starts at 1841. It must be noted that the title of the collection states that the records go all the way up to 1988. In order to check that I did a search simply on the year 1965 (I didn't care to do anything too recent for privacy reasons). 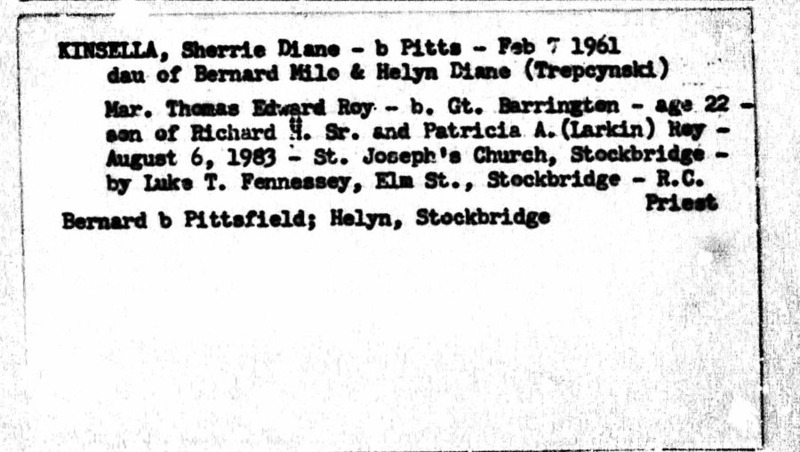 What I found appeared to be compiled records from Stockbridge, Massachusetts. 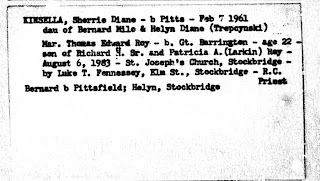 The first page of the collection indicated that the records where compiled by Stockbridge from "town records, church records and grave records." So indeed the database does continue through the 20th century. I have not done a full analysis of the modern records so I don't know to what extent the records exist but it is interesting none-the-less that the collection includes such recent records. While much of the new Holbrook collection on Ancestry.com has records that are easily accessible elsewhere, the record sources as not identical. The fact that these images come from the original town record books makes them very valuable. The 20th century records in the collection do seem to be a new advantage but it is unknown at this point just how substantial and beneficial it will be to researchers until further analysis is done. I wouldn't shout Hip Hip Hooray from the mountain top at the arrival of this collection without further examination. However, having access to images of the original town records, both pre and post 1841 is a definite benefit. It is also a benefit, in general, for Ancestry.com subscribers and it is certainly a benefit for the careful, thorough researcher who cares to take the time to review all versions of a record for comparison purposes. I've been talking a lot this year about getting organized both for my papers and my electronic files. I've been making some great progress but I've got a long way to go. One of the issues challenging me is easy access to electronic files. I'm not talking here about organizational structure. It's more specific than that. A large part of the work I do is researching old houses as a house historian. As a result I end up with a lot of copies of deeds. Typically, depending on the age of the house, I could have 30 - 50 individual pages of deeds per house. I would like to be able to access these deeds easier than just having them as electronic files. For my cemetery transcription project I have an excel file that contains all the data I collect and then hyperlinks to the individual photos. That makes it really easy for me to sort by my criteria of choice and still quickly access the photos. Another idea I have been considering is to set up a personal wiki. Using Wikipedia is just so easy that I was thinking the format would be nice to setup for both work and home items that I want to keep track of. With a personal wiki I would be able to write the history of the house, share photos and easily access the digital copies of the deeds through hyperlinks. I like this idea because I can incorporate all types of media in one location. I'm just not sure how easy it would be to set up and run. I have "technical awareness" but I'm not a technical person. I wasn't able to set up the TNG software on my own so I wonder if I would realistically be able to do this. The last option I have (that I know of) is to use photo organizing software like Adobe Elements and simply tag the photos. My experience with photo tagging however tells me that it is better to keep the tags at the broad level. Tagging at the project level (for each house) might get overwhelming and prove too unwieldy to maintain. My next step will be to research personal wikis to see if that is a realistic option for me. Luckily Wikipedia has a great page on personal wikis to get me started. If the personal wiki option doesn't work out for then I will have to choose between Excel and Adobe Elements. One final consideration is how easily transferred will my software choice be to conversion to future software. Let me know if any of you have thought along these lines or found any solutions to this problem. I can't wait to have my deeds easily accessible at the click of a button! When we start a new project it is wise to do a literature search. Typically a literature search may be done for a specific surname to see what has been previously been published. Or perhaps it's done on a subject such as the French and Indian War. It's very good practice to take a survey of already published materials before you get deep into a research project. But what about when you want to research a general topic in genealogy? Let's use one of my favorite topics, probate, as an example. What would you do to find publications, whether books or articles, that are going to teach you what probate records are, how to find them and how to interpret them? Interestingly enough many of the sources I use such as Ancestry's Red Book for specific information at the state level or Ancestry's The Source contain information about probate but aren't easily located by searching for probate books. Likewise another helpful source, Courthouse Research for Family Historians: Your Guide to Genealogical Treasures by Christine Rose also doesn't generate any hits by searching the keyword probate. When I do an Amazon.com search using the term "probate records for genealogy", it returns mostly probate transcriptions and abstracts primarily at the county level. "That's nice," I think to myself, "but I really want to learn what probate is not see specific examples." One general book did come up in the search results, Will & Probate Records: A Guide for Family Historians by Karen Grannum and Nigel Taylor. This looks promising but how come I've never heard of it before? The name Nigel makes me suspicious that it was published in England. A further look shows me it was published by the National Archives of England. Probably a great book but when getting started I'll need to focus on American records. So then I turn to the Genealogical Publishing Company online. First I do a keyword search on "probate." I have the same problem I had on Amazon.com. Most of the hits are again transcriptions or abstracts. There is one general source listed Probate Jurisdictions: Where to Look for Wills by Jeremy Gibson. It looks excellent (despite being out of print) but ironically enough this book is also British. Admittedly I am only glancing at the first page of hits. I'm not really willing to search through hundreds of transcriptions to find what I'm looking for. Maybe I'm approaching this wrong so I decide to drill down through "Browse Our Full Catalog" and then "Browse by Category." At this point I choose "Wills and Probate Records." Here I encounter the same results as the keyword search, heavy on transcriptions with only the Gibson text offering general instruction. I then move on to the Periodical Source Index (PERSI) which is an index of published genealogy articles. 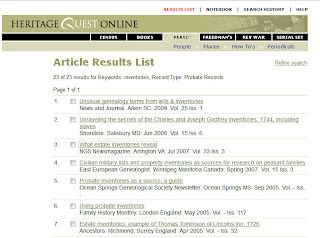 I access PERSI through HeritageQuest using an online database from my local library. PERSI is great because you can actually search for specific record types from the How-To's search option. The search for probate records turns up 729 results! That's too much for me to sort through but some of the titles look interesting. I go back and add "inventories" as a key word on my search. That narrows the results to 23 articles. One article called "What estate inventories reveal" was published in the NGS Newsmagazine in 2007. I might actually have that in my stack of old magazines. Two other titles look promising - "Using Probate Inventories" and "Probate Inventories as a source" both published in the Great Migration Newsletter (2000). 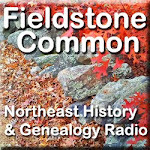 I know I will have access to both of those at the New England Historic Genealogical Society. Most PERSI searches however, return results for state or county newsletters, many of which are only available through the Allen County Public Library. Their copy service is a great benefit but I want something more easily accessible than that. Now I already know quite a bit about probate but as you can see finding information about probate would difficult for someone not well versed in genealogy. What if I want to go beyond basic sources? Say I want to get deep into historical probate records in New England and the laws that impacted them. Where would I turn? I would search the JSTOR academic journal database and specific library catalogs from perhaps the Boston Public Library, the Massachusetts State Archives and the New England Historic Genealogical Society. 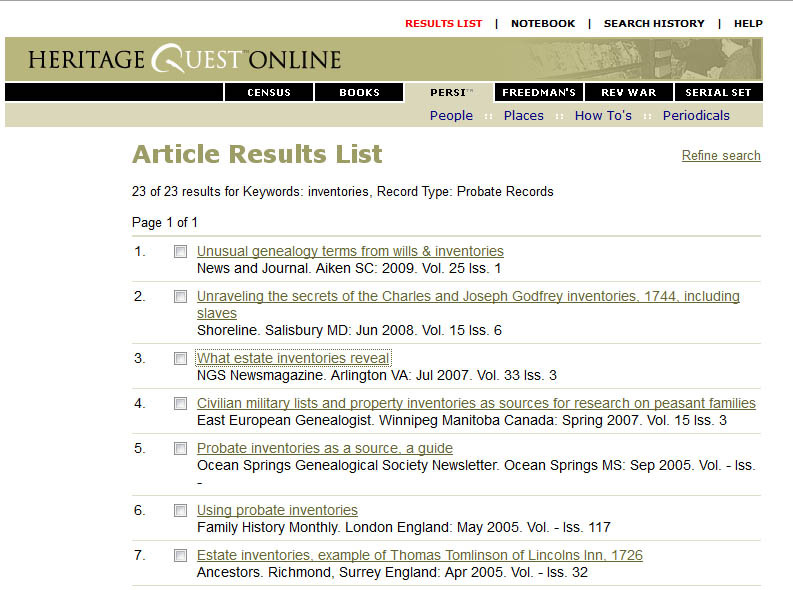 I could also search through the indexes of the peer reviewed genealogical journals. I may get lucky and find something or I may again hit on transcriptions and abstracts. Is the problem that most general genealogical books are written to cover many record types rather than taking an in-depth look at just one? I hate to say this but it all seems like so much work. You would think that after someone does extension bibliographic development that they would pull it all together in a how-to article. I suppose that's what speakers do with their syllabi but I can't access their syllabi on the internet. (...which reminds me of the option of Jamb inc conference recordings). There is at least one example that I know of. If I were to search for literature on 17th century New England I would have to look no further than Martin Hollick's New Englanders in the 1600s: A Guide to Genealogical Research Published Between 1980 and 2005 (NEHGS, 2006). This book, unfortunately, is a rare find. I feel like I am whining with this post but I think it should be easier for new genealogists and even more advanced ones to find the resources necessary to learn what they need to know. Of course, all you really need to do is find one well-sourced book on your topic. That should contain a bibliography sufficient to refer you to all other needed sources. But the trick is finding that book. Please let me know if you have found an easier solution to literature searches. Maybe I'm going about this all wrong. I think I could take a week long institute course just on how to do proper literature searches. I've been working on photographing my local historic cemetery for the past seven years. I did it fairly casually for the first five years. I'd wander through the cemetery and randomly take photos. Eventually I realized this was not the most effective way to ensure that I got a photo of each stone. My local library's website has a transcription of the old section of the cemetery that was created in 1900 by a local town historian. I used this as the basis for my cataloging. Last week I started cataloging in earnest, making sure I photographed all the stones I had missed. As I photographed I took the time to compare the information on the stone to the epitaph in the transcription. Imagine my surprise to find errors in the transcription! There were cases where the dates in the transcription had the day wrong, the year, the month or all three. A few gravestones weren't cataloged at all. And some of the transcription mixed up people with the same name. I got to thinking about this dilemma. As a genealogist and historical researcher I want to be able to pinpoint the problem. The transcription on the website was typed and not an image of the original transcription. So I had to ask myself two questions 1) Were the errors in the original transcription or 2) Were the errors introduced when converted over to an html file? I can imagine two scenarios. Either someone manually typed up the list and posted it online or some kind of OCR software was used and then copied and pasted into the html file. In either manner errors could be introduced. Last night I was at a meeting where there were some folks from the local historical society. I asked them if they knew the background behind the online file. They didn't but they did have a pdf of the original 1900 transcription that they could share with me. Then the conversation got a bit sticky. 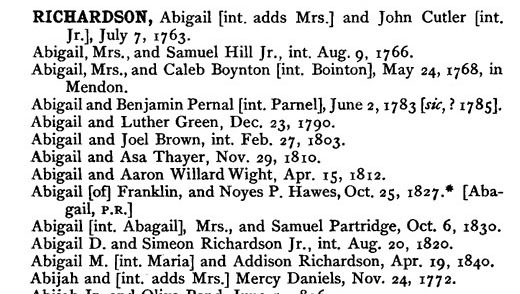 I have to stop here and say that genealogists have a reputation, for better or for worse, of being very precise. Honestly, it drives most non-genealogists crazy! The folks at the historical society are very patient with me. They do their best to answer my questions without saying, "Are you crazy? What does this really matter anyway?" So the big question I popped for them was whether their pdf file was images of the original transcription or an OCR translation. OCR, for those of you unfamiliar with it, is optical character recognition. The special software not only captures the information but turns the content into searchable text. This is a huge advantage over simple images of a publication which are not searchable. The problem with OCR scanning is that the conversion is not 100% perfect and errors are introduced into the text during the process. They couldn't remember the answer to that off the top of their heads but the gentleman who did the scanning says what is important is when the scanning was done. More recent OCR software is much better than old OCR software. To me, that logically make sense. But the genealogist inside of me is still wary and wants to know the exact likelihood of errors being introduced. I will never really have my answer without comparing the pdf file to the original publication. Do you ever think about that when reviewing a document? (I hope so!) How many generations removed is it away from the source? In this case the online transcription is two generations away from the source. The first generation is the 1900 published transcription and the original source is the gravestones themselves. When we are thinking about pdf files we have several things to consider as well. 1) Is the pdf an image of the original? This can be a benefit for genealogists because there is no question that we are seeing the document as it was published. The disadvantage is that it is not searchable with a computer. Let's hope it's not a long document. 2) Was the OCR scan done recently or quite awhile ago? Without knowing the person who did the scanning this question could be impossible to answer. Should we trust old OCR scanned pdfs less than more recent ones? Yes, OCR scans to pdf do have the incredible advantage of being searchable but we must remember that the document is now one generation further removed from the original. This is just some food for thought to get your morning started. I am no technical expert nor do I know the ins and outs of pdfs. If you are more technically advanced perhaps you could share some feedback in the comments. In the meantime, I'm going to have to compare the pdf from the printed original or just works strictly from the original publication. Are You Losing an Important Resource? Every day on Facebook and Twitter I see status updates that say "A distant cousin just emailed me!" followed by expressions of jubilation and joy. Yes, it is wonderful that you have made contact with relatives who can potentially help you in your research. But are you letting the interaction go to waste? What are you doing to preserve the exchange of information? I realized this year, especially after my recent exchanges with my uncle about the old neighborhoods in Pittsburgh, that there is a tremendous amount of genealogical information contained in the body of emails. Not every email has a ged or pdf attachment that can be easyily saved. Some emails have drips of important family history information. Some simply recount an exchange of research conducted. I have implemented a policy to save all emails that contain family history information. And by saving I don't mean not deleting them! I use the 'save as' feature in my email and save the text of the email as a txt file in the appropriate genealogical folders on my computer. In the last year I have gone through two computer crashes alone. While I have the old email files they are not in my current email file. That means I have to do a little work to find them. What if someday I accidentally delete them or forget where they are? If I save individual emails as text files I never have to worry about the original email. I have gone back and saved all the critical emails from my uncle from the past few months. Now I need to do some deeper work and mine my old tucked away email file as well. What about you? 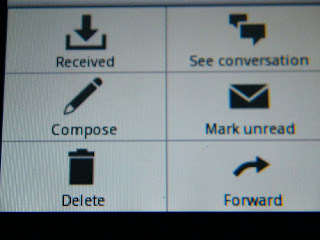 Do you regularly save your emails from family members or distant cousins? You could be losing a tremendous resource if you don't. Photo credit: photo by digitpedia and used under the creative commons license. This past weekend I participated in the Family Tree University Spring 2012 Virtual Conference. I have attended many virtual webinars as well as the live streaming events from RootsTech but this was my first completely virtual conference. At the start I wasn't sure how I would feel about it. I can say without hesitation now that I loved it! The FTU Virtual Conference did require a paid registration. It is not my goal with this post to get into a discussion about cost or whether the price was worth it. Clearly it was worth it to those who registered. What I would like to focus on is the concept of a totally virtual conference. I was not sure what my learning experience was going to be like. Would I get as much out of it as I do at an in-person conference? I was surprised that I found the conference to be very fulfilling. In addition to the webinars which could be downloaded and saved on my computer, there were live-chats, discussion boards, raffle prizes and more. I love to listen to webinars from all the various providers that are out there today. Having a conference with lots of webinars over the course of a weekend really made it feel like a conference. I have to admit that I learned a lot. Like at any conference some presentations will interest you and some won't. All the ones I watched were professional and well done. There were 15 webinars in all presented at this conference. Virtual conferences may not be for everybody but I can see them really filling a need for those with young families who can't get away, people who live a great distance from available conferences or people who simply can't afford the cost of a national or regional conference. I believe that there is room within the genealogy community for all types of education whether they are institutes, stand alone webinars, online or in person classes or traditional conferences. The variety of different types of genealogical education is a real benefit for the 21st century genealogist. I really believe that all these types of educational programs can provide quality education. Granted they each have their different levels, focus and goals but overall they are all advancing genealogical education. I am really excited by video learning! I could envision a company developing and focusing on the production of genealogical videos. They would produce courses that start with step one and can meet the needs of novices such as those that are getting excited about family history from watching Who Do You Think You Are? each week. Is there enough of a mainstream market for these videos? Maybe not directly to the general public but I would love to see these videos created and sold to public and private libraries. Wouldn't it be great if someone watched a genealogy program on tv and then went to their local library and got out an entire video course on genealogy research? There could be videos geared towards adults and others targeted to children. The videos could give them a complete education on genealogical research and get them started in the right direction. I think it would be a wonderful thing. How do you feel about the concept of a virtual conference? Would you attend? Have you attended one in the past? Do you feel that taking classes from videos is a viable option? Let me know what you think. It seems that in each generation there is one designated person who is the family historian. Other family members are either mildly interested or roll their eyes at any discussion of family history. It doesn't have to be this way. With the advancement of technology it's the perfect time to get the whole family involved. The problem is that in the past we have equated family history with research. Not everyone in the family is interested in doing family history research. There are now many other ways to get family members involved in collecting family history information without them having to do any research. The key idea is that we need to draw on each family member's strengths and interests. For example, this past weekend my brother converted 55 minutes worth of audio files from the 1970s and 1980s. He took the cassette tape originals and converted them into mp3 files which could easily be shared over the internet and played on a computer. While he was in the process of doing the conversion he sent out five separate teasers. Each teaser contained 2-3 minutes of audio and a very provocative, catchy headline. He sent the teasers to the entire extended family. At the completion of his project he again emailed the entire family with a link to downloadable audio files of the entire 55 minutes (culled down from 5 hours worth). My brother is not particularly interested in doing genealogical research. Yet what he did provided a incredible service to me (the family researcher) and the rest of the family. Harnessing his love of computers and technological skill provided us with a way to preserve our family memories for many generations to come. Quite a number of the people whose voices are heard on those audio files are no longer with us today. What a treasure it is to hear their voices again and to know that we will be able to pass them along. By distributing the audio files with the rest of the family, it will also encourage more of our family to get interested in learning about our shared family history. When trying to get family members to participate in family history think of ways to harness their interests and passions. When you think about it there are lots of ways to get your family involved in family history without having them do research. Remember, once you get your family involved be sure to share the end product with as much of the extended family as possible. Nothing breeds excitement and participation like sharing and getting others involved. When you attend a conference, either online or in person, do you have a strategy for getting the most out of it? Sometimes it's not possible to attend all talks due to concurrent sessions. Hard choices have to made about the best way to use your time. I have heard that some people choose sessions based on the syllabus. Talks that have very thorough handouts are skipped in favor of ones that have little on paper. I can understand that but at the same time it seems counter-intuitive to me. Perhaps the talk with the weak syllabus also has less substantial live content. Over the years I have developed a quirky but very specific way in which I choose the sessions that I go to. 1) Rock Stars - I hate to use that term but it fits. If I'm at a conference where Elizabeth Shown Mills or Dr. Thomas Jones is speaking I will likely not miss the opportunity to go to see them. I would even go so far as to watch the same talk multiple times at various conferences. There are some people you just need to hear if you have the opportunity. 2) The Geography Factor - In a time slot where there are no rock stars I will then fall back on geographic selection. If I'm at a regional conference in New England I will choose to watch the presentation by the speaker that comes from the furthest away. The logic is that I will likely have access to local speakers at some other point during the year. Speakers from far away are much harder to see in person. If they have made the effort to come from a great distance I will return the favor by attending their presentation. With online conferences we don't have the same physical restrictions as we do with in-person conferences. We can attend from the comfort of our home through the internet. An online conference still forces us to make choices. Are there concurrent sessions that we must choose from or is it a simple matter of prioritizing which sessions we watch first? 1) New Topics - My basic strategy for prioritizing online conference watching is to choose the content that I know nothing about. It may even be on topics that I will likely never research. Something new, however, will hold my interest more than a topic I already know about. And even if it seems out of my research area I will very likely get some new ideas or strategies that I can apply to my own research. 2) Same Topics - This may surprise you but after watching the topics I know nothing about I will head for topics that either I think I know everything about or I have already heard someone speak on. For instance, last Saturday I heard a presentation by Walter Hickey of NARA Northeast Region (Waltham, MA) give a talk on the coming 1940 US Federal Census. Then on Wednesday, I listened to the webinar on exactly the same topic by Thomas MacEntee. Many of you are likely shaking your heads and saying that is a waste of time. It's not really. The explanation I received of how high school is different from college is that in college you learn critical thinking. Critical thinking is necessary for evaluating sources to come to a more informed conclusion. When I watch a presentation on one topic and never take advantage of further talks on the same subject then I am learning with a one-sided viewpoint. By hearing two speakers on the same topic I can evaluate better all the information I received. I admit I was a bit hesitant to hear both Walter and Thomas present on the same topic. I worried that perhaps one speaker might disappoint me. In reality what I heard were two excellent presentations on the same topic. I learned that individuals will approach topics from different viewpoints and provide different solutions or suggestions for tackling research. I was amazed that two talks sharing the same basic limited subject could be so different from one another. So in this strategy I would seek out presentations on topics that I've already been exposed to in order to help me better evaluate the information. Hopefully I've given you some food for thought. What are you conference learning strategies like?